Lakeview Manor is a piece of property in Falkreath Hold, north of Pinewatch. It is one of three potential homes available with the Hearthfire add-on. After installing Hearthfire, you may purchase this plot of land at the Jarl's Longhouse in Falkreath. If Siddgeir is still the Jarl, speak with his steward, Nenya; if the Stormcloaks have control of the hold, speak with Tekla, steward to the new Jarl, Dengeir of Stuhn. You will have to complete the quest Kill the Bandit Leader before being allowed to purchase land if Siddgeir is Jarl. If you are level 9, then a letter from the Jarl of Falkreath may arrive; reading it gives you an objective to talk to the Jarl, as a part of the Falkreath version of Build Your Own Home. However, if this has not happened yet, then Siddgeir will require you to complete his version of Rare Gifts before giving the Bandit Leader quest, and the dialogue option to start this quest will not appear if another version of the quest is active. If Dengeir is Jarl, then he will allow you to purchase property out of thanks for your help installing him, whether this was because of events in Season Unending or because you conquered Falkreath for the Stormcloaks. When you ask the steward if you can buy a house in the hold, you will be told that there are no houses for sale at that time, but a new plot of land is available. It will cost 5,000 gold. Your new property, Lakeview Manor, will be marked as an undiscovered location on your map, located between Falkreath and Riverwood. When you arrive on your new plot of land, you will find a drafting table, carpenter's bench, anvil, and chest directly west of the housebuilding area, sheltered by a small cliff. Follow that same cliff face a few steps north to find the stone quarry. There is a clay deposit, wood chopping block and log pile directly west from the carpenter's workbench, on the other side of the dirt path. You can begin building your home immediately, with materials provided in the chest when you first arrive. A unique feature at Lakeview Manor is that you have the option to build an apiary. It comes with one piece of honeycomb and some bees. Bleak Falls Barrow can be seen from the north end of the property, beyond Lake Ilinalta. Should you become a Thane of Falkreath, Rayya will become your housecarl. She will move to Lakeview Manor upon construction of the small house layout. The apiary is the unique feature for this homestead. It is initially stocked with 1 Honeycomb and 5 Bees. When the apiary has been emptied, it will eventually be stocked again with these items. Because it respawns, it is not safe to store items in. 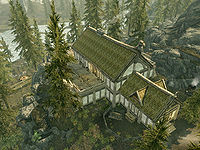 Compared to Windstad Manor and Heljarchen Hall, Lakeview Manor sees more random spawn events, including bandits, giants, and wolves. A warlock can be found a short distance behind the house on the north side, down the hill. If you have children and you ask your spouse how the kids are, your spouse may respond in support of the location: "Fine, love. I think the fresh air does wonders for all of us, and this house... it's just perfect." However, other spouses may comment that living in a homestead is too dangerous for children: "Fine, when we're not fending off attacks by wolves. Or bears. Or giant spiders. Honestly, what were you thinking, sending us out here?" You can find two iron ore veins just to the south of the area, between the crafting area and the pond. There is also a corundum ore vein up the slope to the southwest, around a large gray rock. Down the hill before coming to the warlock is a deceased wood cutter lying next to the unique battleaxe The Woodsman's Friend. Completing the Dark Brotherhood quest Kill Helvard results in a negative disposition towards you from the Jarl of Falkreath. As such they will not have a high enough disposition towards you in order to offer the dialogue option to purchase the Lakeview estate. This issue has been addressed by version 2.0.4 of the Unofficial Skyrim Patch; it corrects this oversight by removing the disposition modifier from the quest. You can set the Jarl's relationship to a high enough level using player.setrelationshiprank RefID 4 (replacing "RefID" with Siddgeir's or Dengeir's). 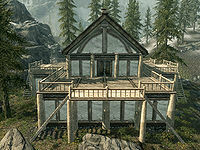 Changing the jarl through the Civil War questline will automatically give you a high enough disposition with the new jarl in order to buy the property. Spouses are scripted to visit the top of the armory porch during the day. If you didn't get this addition, however, they will simply walk to where the stairs would be and stand there until nightfall, occasionally walking in place. If your spouse has been kidnapped and you get a message that says your spouse has been returned, you may find your spouse in your bed, but they will not move and you can not interact with them. ? A massive system freeze may occur in the home which will continue happening if reloading the autosave created upon entering. ? Removing the workbenches seems to fix this issue. The area around the house may experience physics glitches, such as flickering badly. The system may instantly crash upon attempting to approach the area around the manor. The system may instantly crash upon attempting to place anything on pedestal 0300a8f5 in the Trophy Room. ? The objective "Speak to the Jarl of Falkreath" may become stuck in your miscellaneous quests and not disappear on speaking to the jarl. This bug is fixed by version 2.0.5 of the Unofficial Hearthfire Patch. You can fix this using the console command: SetObjectiveCompleted BYOHHouseFalkreath 15 1. The southwest side of the house next to the location for the animal pen and tanning rack (to the left of the entrance door) is a spawn point for insects. It might become glitched, allowing torchbugs and luna moths to appear during the day, and butterflies to appear during the night. Enemies that randomly spawn outside the house, such as bandits, may spawn inside the footprint of the house, where they cannot be reached. If you ignore them, they will disappear on their own. You can use the console command tcl to pass through the walls of the house and attack the hidden opponent.